Alfredo Castañeda, like José Luis Cuevas, has become the heir to the surrealist movement that has come from Europe since 1922 and was adopted by many Mexican Artists. Since the 40's there ware several styles that derived from this current. 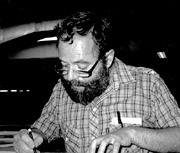 The figurativism that Castañeda has adopted was deeply influenced by this movement and his greatness and impeccable technique for drawing has created a fantastical universe that gives his work a staple. Hi has since become one of the most valued artists in Mexico. He was born on February 18, 1938 in Mexico City. Studied painting from 1950 to 1954 with his uncle, J. Ignacio Iturbide. In 1956 he started a major in Architecture that he left three years later to travel to Europe. 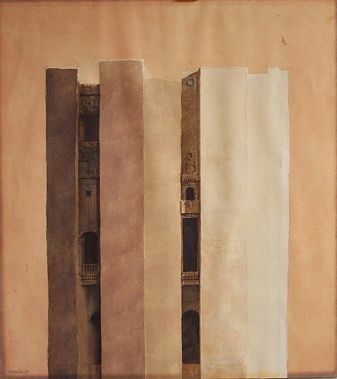 During his stay here he dedicated all of his time to painting, and upon his return to Mexico, he finished his studies and became an architect in 1964. He held his first job as an architect in 1962 and made it his profession until 1971 when he became a full time painter. Castañeda has created through his works a universe of dreams with a whole new figurative symbolism that he made his own where most of his ideas come from poetry and philosophy. More than just being a surrealist, he has worked on consciously communicating his internal feelings and ideas to the outside world without being tied to the constraints of reality. In a sense, Castañeda's art seems to be an explanation of his own moral code in a purely visual way and it's reason is his own self enlightenment.